Athletes from 79 NOCs won at least one medal. The United States won the most gold medals (44), as well as the most medals overall (101). Donovan Bailey of Canada set a world record in the men's 100m race (9.84 seconds). Michael Johnson of the United States also set a world record in the 200m race (19.32 seconds) and Naim Suleymanoglu from Turkey also set the record of three consecutive Olympic titles in weightlifting. Armenia, Azerbaijan, Belarus, the Czech Republic, Georgia, Kazakhstan, Kyrgyzstan, Moldova, Slovakia, Tajikistan, Turkmenistan, Ukraine and Uzbekistan were represented for the first time at a Summer Games. Czech Republic and Slovakia had competed previously as Czechoslovakia, and the other nations were formerly part of Soviet Union. Of these, Kyrgyzstan, Tajikistan, and Turkmenistan did not receive any medals. This Olympics also marked Hong Kong's final appearance as a British colony, before its handover to China, during which it also won its first ever medal; a gold in sailing, making it the only medal Hong Kong ever won while under British rule. 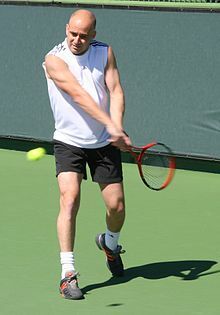 Andre Agassi won the gold medal in the men’s singles tennis competition. The medal table is based on information provided by the International Olympic Committee (IOC) and is consistent with IOC convention in its published medal tables. By default, the table is ordered by the number of gold medals won by a NOC. The number of silver medals is taken into consideration next and then the number of bronze medals. If nations are still tied, equal ranking is given and they are listed alphabetically by IOC country code. Medals won in team competitions are counted only once, no matter how many athletes won medals as part of the team. ^ a b c d e "Atlanta 1996". International Olympic Committee. Retrieved 11 March 2010. ^ "Medal count for the 1996 Summer Olympics". databaseSports.com. Archived from the original on 5 November 2011. Retrieved 22 November 2011. ^ a b "1996 Atlanta Summer Games | Olympics at Sports-Reference.com". Sports Reference LLC. Retrieved 22 November 2011. ^ "1996". The Hutchinson Chronology of World History. 2011. Retrieved 23 November 2011. ^ "Niam SULEYMANOGLU | Olympic Athlete | Atlanta 1996, Barcelona 1992, seoul 1988, Sydney 2000". International Olympic Committee. Retrieved 22 November 2011. ^ Shipley, Amy (25 August 2008). "China's Show of Power". The Washington Post. The Washington Post Company. Retrieved 22 July 2010.